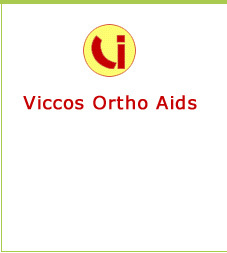 Viccos Ortho Aids deals in traction kits, specially designed portable apparatus or traction pulley for use at home. hospitals and private clinics. Traction products are very effective in relieveing pain associated with cervical spondylosis. Especially designed from durable cotton fabric with Polyrethane foam insertion with velcro closures for better fitting, easy adjustment and removal. Two sturdy slings with rings help to give traction. An effective and practical treatment recommended by doctors to patients suffering from lumber spondylosis. Very useful for giving traction to the lumbosacral region for relief of the low back pain to maintain normal alignment of the vertebrae. Complete kit with H.Sq Traction Pulley , Pelvic Traction belt, Spreader Bar, Cord, optional water/sand weight bag. The amount of weight to be placed over the pulleys should be followed as per the doctors instruction. If any extra weights are required then the same can be provided with an extra charge. 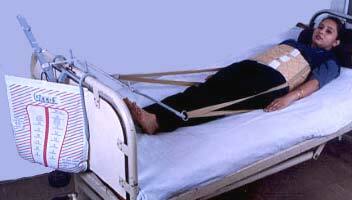 The traction pulley can be fitted in all hospital beds, home beds and private clinics which have either head or leg frame. The pulley has to be placed and adjusted on the higher frame with an angle at 50".